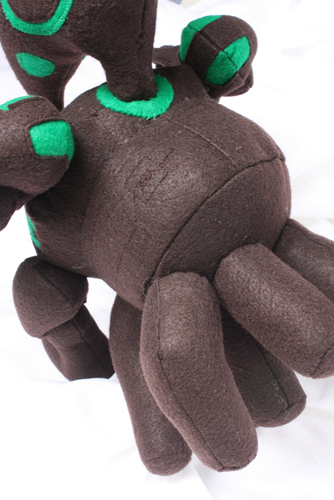 A few weeks ago I made my first Perilous Myr plushie, mainly because people like me like to do really nerdy things with crafting supplies. It turned out, you might say, explosively well. And of course the obvious thing to do when you’ve just finished a stupidly time-intensive project is to turn around and do the whole thing again, making it even better. 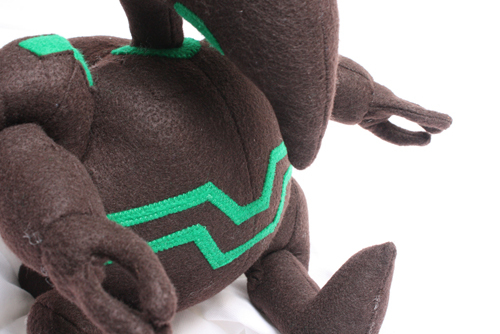 This post marks the creation of a second Perilous Myr plushie, new and improved. 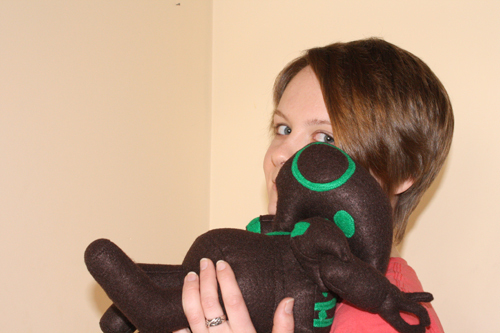 Plus this guy’s for sale over in my Etsy store. He’s largely the same as the first myr, with a few notable improvements. Oh, and as my friend Graham noted, you’d better be careful if you take this guy home; if he ever goes to the graveyard, he’ll take another stuffed animal with him. 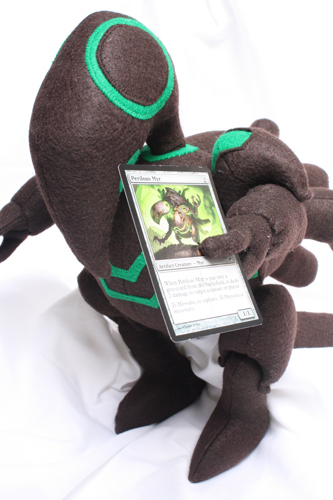 I estimate that this guy took 8-10 hours to make, mainly because he involves a perilous amount of hand sewing. 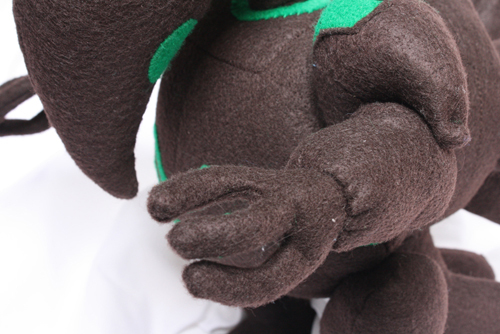 It actually took way longer than that to put him together, but some of that time was spent figuring out how to rework his back plate, and taking photos for the upcoming Perilous Myr plushie pattern and tutorial. His arms and legs are pretty much the same as those of the first Perilous Myr, except for the hands. I cleaned up and streamlined the process of making each hand, so they’re now one piece instead of three individual fingers. They still contain wire for posability, though. 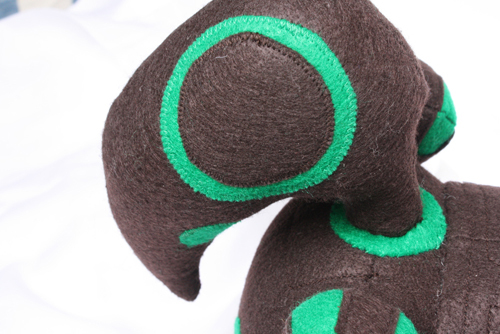 His body is now made up of four pieces, rather than three (hence the seam down the front), which makes him just a bit rounder. 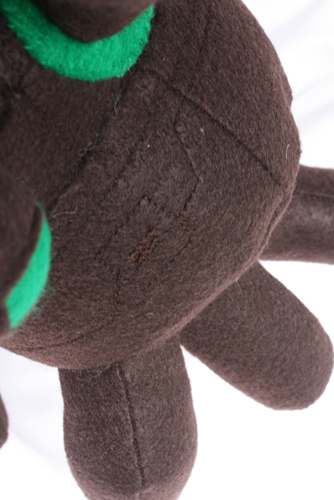 I also added some stitching around the neck area to simulate some of the detail of the card art. The head I reshaped slightly to be more angled and better defined. I’ve also added that green ring at the base of the neck, which I completely forgot the first time around. And the back. This is where the real changes happened. I’ve started thinking of the Perilous Myr’s backplate as a sort of thumbprint – each one is slightly different. I wasn’t happy with the back on the first one, so this time I sewed a large protruding half-sphere from which the pipes protrude. 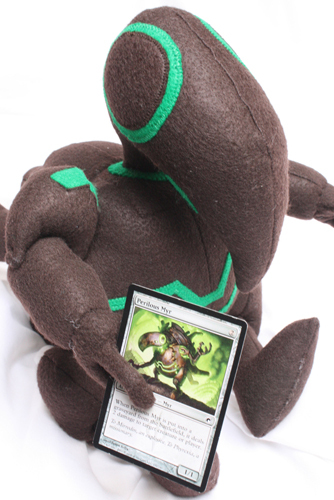 The overall effect is to make him much chunkier and more substantial, which is more in line with the card art. I also reshaped the pipes a bit, making them wider, so there appears to be more of a profusion of machinery back there. And I did a bit of detailed stitching on the sides of the backplate, again to simulate the details on the card. Isn’t he sweet? 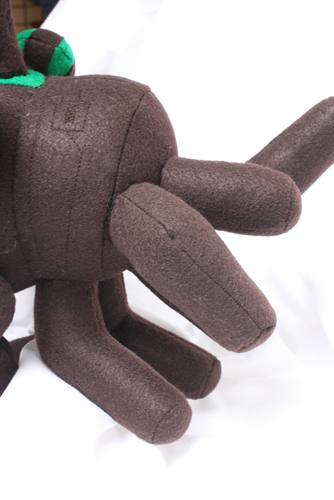 Like a very strange, dark and alien baby doll… um. This one does look good. I popped over to Etsy and was surprised to find it wasn’t sold yet. It is quite expensive (though believe me I understand why: 10 hours of creative effort plus materials means it’s a fair price), but I’ll be considering it. I am so happy to hear there’s a tutorial and pattern coming up. Really want to try and make this. Awesome! I’m so glad you like him. :) May he strike down your every foe. Can’t wait until you release the design! not understanding something completely, except this article gives fastidious understanding even.